With a soft and spongy texture, flavored with coconut and condensed milk and then topped with a creamy vanilla custard sauce – your taste buds will dance with joy with each bite of this favorite Filipino delicacy. Preheat the oven to 350 F. Generously grease the bottom and sides of a baking dish (9×9 or an 8×11). In a large bowl, whisk together the grated cassava, condensed milk, coconut milk, eggs, and ground cardamom (if using) until well-mixed. Pour into the prepared pan. Bake for 50 minutes or until almost fully set. Remove from the oven and pour the custard sauce on top tilting the pan gently to ensure that the sauce has spread evenly. Bake for another 20 minutes or until the custard has set. Remove the pan from the oven and set the oven to broil. Sprinkle the brown sugar on top. Place under the broiler for about 2 minutes or until the top is nicely golden and caramelized or use a flame torch to achive the same result. Cool completely before slicing. I promise this is a slice of heaven! 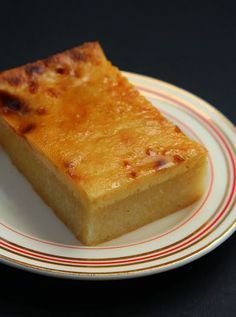 0 Response to "Cassava Cake with Creamy Custard Topping"